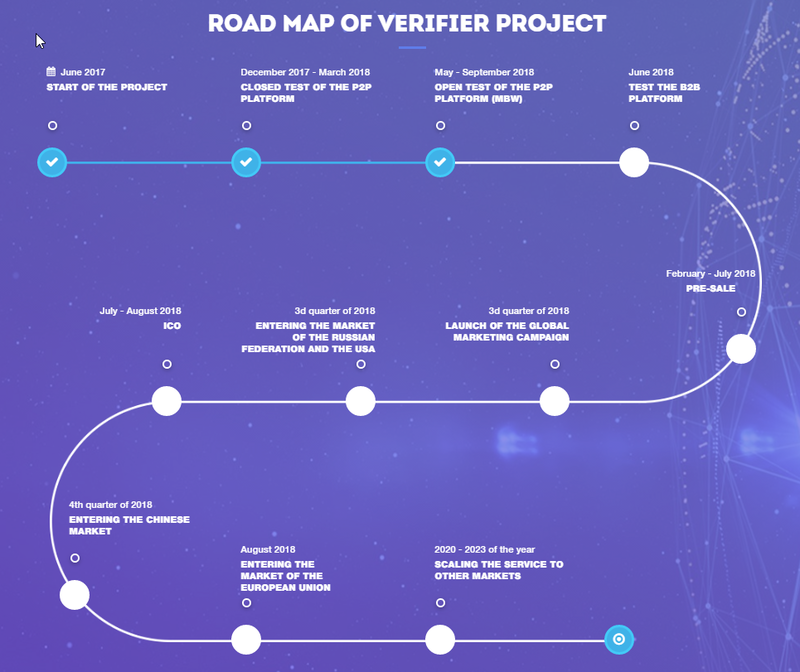 Verifier is a blockchain based remote fact-checking system for various data verification. We solve the problem of mistrust in remote/digital business communication between people around the globe. Our solution is a platform that verifies data quickly, accurately, trustworthy and securely. ‍Verifier operates both through a mobile and desktop App and like Uber facilitates direct deals between clients and “verifiers" who provide the service. Any individual or company may serve as a verifier. Once there is a need to confirm someone’s identity or the accuracy of any fact, an independent agent, a verifier, is randomly chosen, ready to arrive and provide proof in any form, whether it is photo, video, or any other materials. To ensure security all data is encrypted. Verifier tokens will be used to cover transactions and system operation during the verification process in the app. It will be linked with crypto exchange price/demand. Demand for Verifier service (transactions) will build a significant basis for investment price value of a VRF token. The upside for VRF token sales is 20-40% (depending on the volume and the timing). The raised funds will be used for marketing and further development of the system in order to grow our audience. We issue Verifier tokens (VRF) supported by the smart contracts on the Ethereum platform. The VRF token is an internal currency for the Verifier ecosystem. It will be used for payments between the platform users. Verifier is an innovative technology designed to verify identity, events, deals, and any other kind of data. We created a decentralized network of independent agents (DNV), the verifiers. Any individual may serve as a verifier after registering in our system and successfully passing all necessary examinations, such as specifically designed tests, background checks, etc.